An Open Invitation To Get Racing! 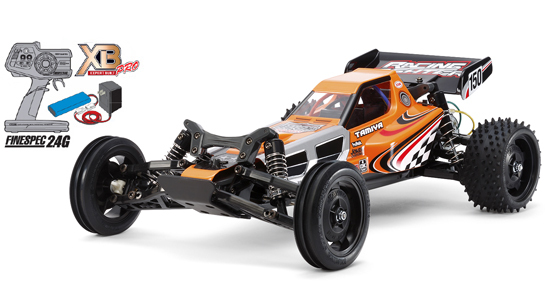 This is a factory finished R/C model of the Racing Fighter, a model inspired by real-life single-seater buggies. The stylish body has a sleek nose and lowdown cockpit, which comes in pre-painted durable polycarbonate. Stickers are pre-applied to create lively markings and framework depictions along the sides of the nose. The long, slender yet tough frame of the DT-03 is combined with 4-wheel double wishbone suspension plus front ribbed and rear square spike tires. You won't be able to resist the temptation to take this exciting newcomer racing! 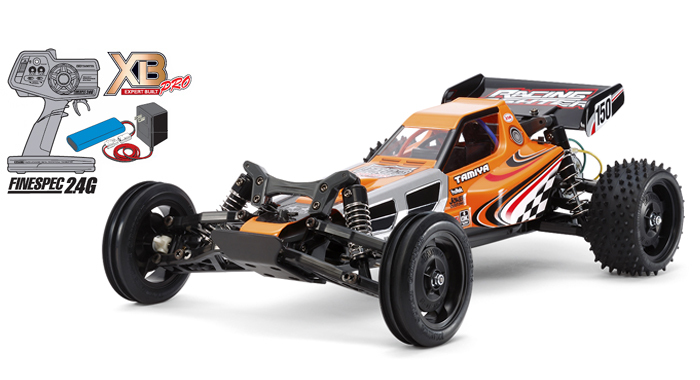 The stylish slimline form of this chassis stems from its lightweight yet durable monocoque frame, which features a longitudinally-positioned battery and the R/C equipment along the centerline for excellent balance. The combination of a long 287mm wheelbase and 4-wheel double wishbone suspension married to friction dampers with long arms, allows the model to handle with stability on poor surfaces. Ribbed front and square spike rear tires provide ample grip, and the rear-positioned gearbox is sealed to protect from dust and dirt, with the built-in differential gear offering smooth cornering. In addition to the painted body, this item also includes a wheel-type transmitter, battery pack and charger to allow instant enjoyment of driving. (*Battery pack and charger are included for Japan market only.) 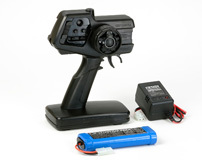 The 2.4GHz transmitter eliminates the need for frequency crystals, and is factory-paired with the receiver in the model to ensure that the receiver communicates with that transmitter only. 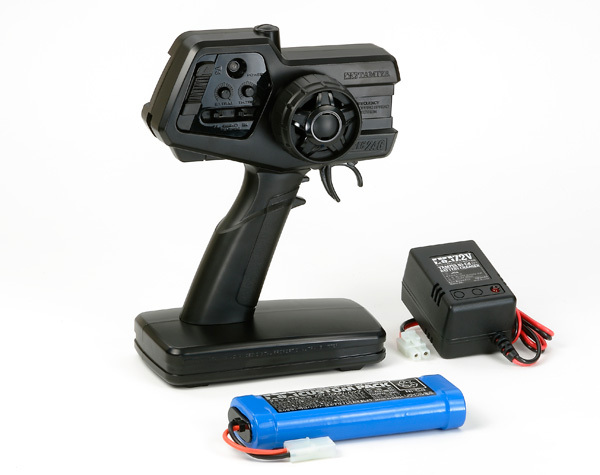 Transmitter features detachable grip covers to match your hand size as well as a throttle trigger cover to increase the size of the throttle trigger for easier operation. Information is correct as of May 27, 2016. Specifications are subject to change without notice.